The Accessory Boxes - Page 2. Circa 1978-80. The hobby crest. In the late 1970s the boxes were redesigned to show a unified face. Subbuteo is written in a bold black typeface, with the name of the item in white. There is also a monochrome drawing of the item enclosed. Most of the smaller items are now placed into bubble packs. The card backing of these bubble packs show the hobby crest and the standard football match illustration of the era in monochrome. This picture can also be seen on the team boxes, and was used in colour on the display, club and floodlighting editions. Sets first introduced to these boxes start at C140, and continue to C180. Variations in the hobby crest era. Both the Grandstand and the floodlights have big colour photos of the accessory on their box. This is the first time photos have been used. We also see cellophane inserts for the first time to show the teams in the European Cup Winners, and FA Cup Final sets. Subbuteo received another redesign in time for the classic 1981 catalogue. This sees the Subbuteo name receive its curving border for the first time, and any other logos are removed. From now on, the Subbuteo name becomes the logo, with the words "Table Soccer" written underneath. As you can see, the boxes are still monochrome and the accessories are shown against a grey background. The smaller items are still in bubble packs - but with the new logo, and with the backing picture updated to the Brazilian player from the 1981 boxed editions. These boxes usually have the Tyne and Wear address, but the early versions may still state the Tonbridge one, and later ones may mention Leeds. This is also the last range to use the "C" numbers. In addition, the backs of the boxes now show adverts for other items in the range. Variations in the monochrome logo era. In this update, the teams were placed in boxes with cellophane on the front, showing the whole team for the first time. A few of the new accessories also had boxes of this type, as we see here with C187 and C189. These are the first boxes that have the new Waddingtons numbers on them, and are from the Leeds address. As you can see, a further improvement is that the boxes now have a photograph of the accessory on the front panel. The bubble packs change to a simple netting background, and the range of items on these cards increases - i.e. even the cups are moved onto card. Except for the colour change, there is not much difference between these and the green logo boxes. 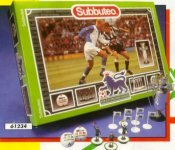 However, at some point in this era the wording under Subbuteo changes from from "Table Soccer" to "The Football Game". If you peer at the boxes above, you can see examples of both wordings. The bubble packs seem identical to those during the green logo era, except that the wording eventually changes on these as well. This design appears around 1990, and carries on throughout the next decade. The Subbuteo logo stays on its red background, but loses the subtitle. The era starts with bubble packs, but then the balls, goalkeepers and cups are all put into boxes. The boxes for the goalkeepers and balls are really much larger than they need to be. Note that the goal boxes now show the contents of the box (i.e. two goals rather than just one). 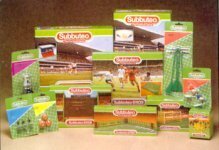 In the 1990s, Subbuteo included a small flyer in each box showing other accessories in the range. For this reason these boxes do not have adverts on the back panel. This extra example shows the Italia '90 version of 61220 in both a bubble pack and a box. Clearly based on the standard 1990s box design, these are the special sets produced for USA 94 and Euro 96. The pitch design remains, but there are variations to it. The cups and final pack of balls (61233) go back to bubble packs again, with a pitch logo framing the card, rather than just showing a corner. The Premiership box set is similar in design to the bubble packs. First seen on the Premiership Boxed Set, this is the very latest box design, although so far only goals and balls have been produced in this style of box.